We regret to announce the passin.g of the following members of Local 867. March 2, 2019 339 Barry Morwick Small private ceremony has taken place. December 7, 2018 516 Tom Payne As per Tom’s wishes, a private service has already taken place. October 21, 2018 736 Edward (Ed) Klassen Funeral service will be celebrated at McIvor Avenue Mennonite Brethren Church, 200 McIvor Avenue, Winnipeg, on Friday, October 26, 2018 at 11:00 a.m. with interment in Glen Eden Memorial Gardens. September 17, 2018 295 Ronald Morden An intimate family Celebration of Life will be held at the Deer Lodge Centre, December 26th, 2018. August 29, 2018 797 Tom Wingert Funeral arrangement pending. August 26, 2018 762 Friedrich(Fritz) Moehring There will be a private family memorial. August 18, 2018 815 Elvin Kehler A Fire Department Funeral will take place at the Army Navy on Portage Ave. Time & Date Pending. August 13, 2018 390 Larry St. Pierre Funeral services will be held on August 24,2018 at 2:00pm in Chapel Lawn Memorial Gardens 4000 Portage Ave.
July 28, 2018 1021 Ed Tworek Funeral services will be held on Friday, August 3, 2018 at 11:00 a.m. in the Gilbart Funeral Chapel, Selkirk, MB. May 19, 2018 148 Louis Desautels Prayers will be held @ 3:00 pm on May 27th at Glen Lawn Funeral Home, 455 Lagimodiere Blvd. Funeral services will be held Monday 2:00pm May 28th at Glen Lawn Funeral Home as well. May 13, 2018 146 Ian Thomson Funeral Service will be at Cropo Funeral Chapel 1442 Main Street on Friday May 18th @ 1:00 PM. April 16, 2018 133 Stan Devanik There will be a Celebration of Life on Saturday, April 21 at Korban Funeral Chapel, 907 Main St., from 4:00 p.m. to 6:00 p.m. with words of remembrance at 4:30 p.m.
April 6, 2018 620 Gerry Meckling He will be put to rest in Mexico. February 15, 2018 772 Les Brown Service will be held @ Cropo Funeral Chapel, 1442 Main Street @ 11:00am on Monday February 26, 2018. February 13, 2018 173 George Hobson Service will be held @ Charleswood United Church, 4820 Roblyn Blvd. Friday Feb. 16@ 14:00hrs. November 22, 2017 0411 Gerald(Gerry) Delisle On Friday, December 15, 2017 Jerry’s Funeral Service will be held at 1:00 p.m. in Wojcik’s Funeral Chapel, 1020 Main Street @ Manitoba Avenue. October 15, 2017 493 Leonard (Len) Cann There will be no funeral. September 11, 2017 1420 Gerald (Gerry) Laurin Celebration of life will take place @ 2:30pm Sept. 18, 2017. in St. Boniface Golf Club, 100 Youville St.
May 23, 2017 1059 Tom Benedictson A celebration service will be held at Bruce Park 1966 Portage Ave (south side) Tuesday May 30th @ noon. April 27, 2017 359 Albert (Al) Davis There will be no funeral. Cremation has taken place. February 28, 2017 258 William (Bill) Bonar A celebration of Bill’s life will take place on Friday, March 10 at 2:00 p.m. at Green Acres Funeral Home, #1 Hwy. East at Navin Rd. Cremation has taken place. January 7, 2017 477 John Lacy A Fire Dept. Funeral will be held at St.. Anthony’s Church, 250 Burrin Ave. on Friday, January 13th @ 11:00 am. January 4, 2017 308 Wray Bone 1400 hours Saturday Jan. 7, 2017 @ Thompson in the Park Funeral Services on McGillivary Blvd. 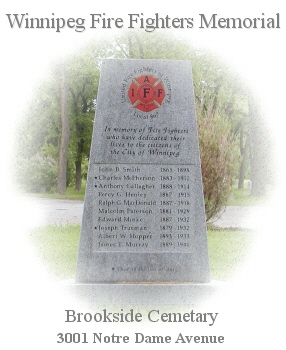 October 29, 2016 193 Henri Ledoyen A Fire Department Funeral @Green Acres Funeral Home Hwy. #1 & Navin Rd. Friday Nov. 4, 2016 @ 10:00 am. October 3, 2016 889 Brian Watson Soul Sanctuary (2050 Chevrier blvd) on Tuesday October 11th @11:00.